Look. There were many, many, many reasons to enjoy Elseworlds, the Arrowverse crossover that aired in November. Every piece of gloriously charming comedy from the body swap between Barry Allen (Grant Gustin) and Oliver Queen (Stephen Amell). Grant Gustin in the Green Arrow suit. Kara (Melissa Benoist) getting to bond with Kate Kane (Ruby Rose, in her small screen debut as Batwoman). Grant Gustin in the Green Arrow suit (y’all know good and damn well why I said it twice, but here’s a reminder anyway). The mind-blowing teaser at the end that has me worried for my favourite SuperFriends. And, truthfully, the comic-book fan in me loves crossovers, or at the very least the idea of them. I love watching all the heroes who don’t usually speak get together, I love the comedy that comes from everyone catching up on what’s gone on in their different cities, and I love anticipating which Big Bad they’re going to draw from the comics. In theory, they’re a comic-book fan’s dream. And for many, they hit the sweet spot that Greg Berlanti, Marc Guggenheim, and the rest of the bigwigs in charge of the Arrowverse were aiming for. Some fans – more, I think, than probably those higher-ups were expecting – were less than impressed, even before the crossover aired. 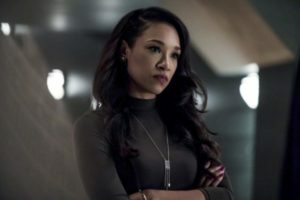 Several bits of news caused them to lose faith in the crossover before they saw it, and they decided to air their grievances in a hashtag called #ElseworldsSoWhite – chief among them, that Iris West (Candice Patton) wasn’t crossing over. Again. The face Iris and I made, upon learning that she wouldn’t be crossing over again. There were other problems, of course, and even the matter of Iris – and more specifically, as we’ll come to see, Patton – not crossing over once again is more complicated than it first appears. I was not surprised, as fans of The Flash who care in particular about Iris West have been known to campaign for her in this way, so much so that creators of the show and Patton herself have acknowledged the fact they’ve made an impact or at least have been noticed. However, upon scrolling through the hashtag, I quickly got annoyed. Not at the fans who were complaining about the mistreatment of minority characters and a Black woman in particular, but at the fans who, upon seeing this…decided to start complaining themselves. What would discussions about representation be without a white man telling women of colour that their problems don’t exist? …or white women telling us about “actual racism”? I don’t think she’s sorry, guys. These are but a small sample of nonsense that people were putting into the hashtag. They were, literally, complaining about the complaining. They hadn’t read the hashtag. They hadn’t asked fans why they were upset. They hadn’t even attempted to understand the problem. But they were mad. One was even taking the time to create a video about it! It was, to say the least, extremely irritating. 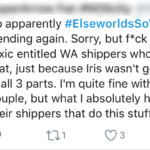 Irritating that people were reducing complaints about mistreatment to “ship things.” Irritating that people are still so uneducated about diversity and representation that they think it’s as simple as having people of different ethnicities on screen. 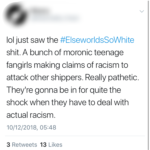 And irritating that as angry as they are about fans campaigning for fair treatment for characters that look like them, those same people are curiously silent on the very real harassment and abuse hurled at the people playing the characters. Which, of course, just so happen to mostly be women, women of colour especially. 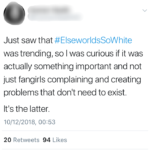 #ElseworldsSoWhite isn’t about ships, and it isn’t about our favourite character. It’s about a pattern of racism and exclusion on a network that continues to say that it is “open to all” while being anything but, in a franchise that insists on collecting diversity points while doing its level best to ignore anyone with too much melanin. And so the reaction to it, insisting that people are being dramatic and that they should simply sit down and take representation wherever we can get it even when it’s problematic, is stupid. So. 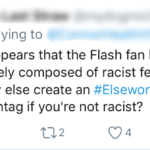 We are going to talk about #ElseworldsSoWhite. We are going to give it context. We’re going to talk about what it is and what it isn’t. And we’re going to talk about how the people complaining need to go sit down somewhere. Like I said. I’m mad.